Previously on Miami Vice: Calderone returned; well, Crockett and Tubbs went to get him and get him they did. Lt. Rodriguez was killed in the line of duty trying to protect Crockett. Crockett also got divorced. People were upset. Mostly me, because there wasn’t a lot of Elvis the gator in those two episodes. After last week’s overcooked two-parter, I’m happy to report that Miami Vice is settling down. Well, as much as a show can settle down while telling stories about the trading of stolen Stinger missiles. Point being, “One Eyed Jack” and “No Exit” work to stabilize the Vice formula involving bad guys, Crockett and/or Tubbs going undercover, cool music, and confrontations on docks/piers. It’s really that simple, and as I talked about in my discussion of episodes two and three, I’m impressed with how easily the show has established this narrative formula without sacrificing any of its stylistic repertoire. Obviously it’s not too tough to establish an episodic template for a police procedural, but I still appreciate how Vice manages to tell procedural stories with its own voice. As anyone who has ever watched a procedural show can attest, one of the best ways a show of that ilk can inject some life into individual episodes is with quality guest stars. When you have great guest stars, it’s much easier for the audience to look past the formulaic nature of the story. The guest star gives us something “new” to lock our minds onto, even if many of the villains of the week (on Vice they should probably be called “scumbags of the week”) are similar. In its first season, Vice wastes no time taking that tactic to heart. Episode two brought us a young Ed O’Neill. Both of these episodes feature familiar faces in Dennis Farina (“One Eyed Jack”) and Bruce Willis (“No Exit”). Now, Farina’s never been much of a star, and this was before Willis’s career even took off (he more or less parlayed his powerhouse performance in “No Exit” into the starring gig on Moonlighting), but both men know how to fill the boilerplate protagonist role that Vice so clearly looks for: intense with the possibility of going off at any moment. Willis’s character is more electric and dangerous than Farina’s, but still, the two men embody the kind of tough and crazy danger that the show likes to throw at Crockett and Tubbs. Farina’s racketeer Lombard is almost more of a presence hanging over the proceedings of “One Eyed Jack” but he still turns in an entertaining performance. He and Philip Michael Thomas have a weirdly great chemistry; there’s this scene where they joke about Tubbs being from “southern Italy… this placed called Africa” that is legitimately funny. It could just be because Thomas’s performance is so over the top, but it works. 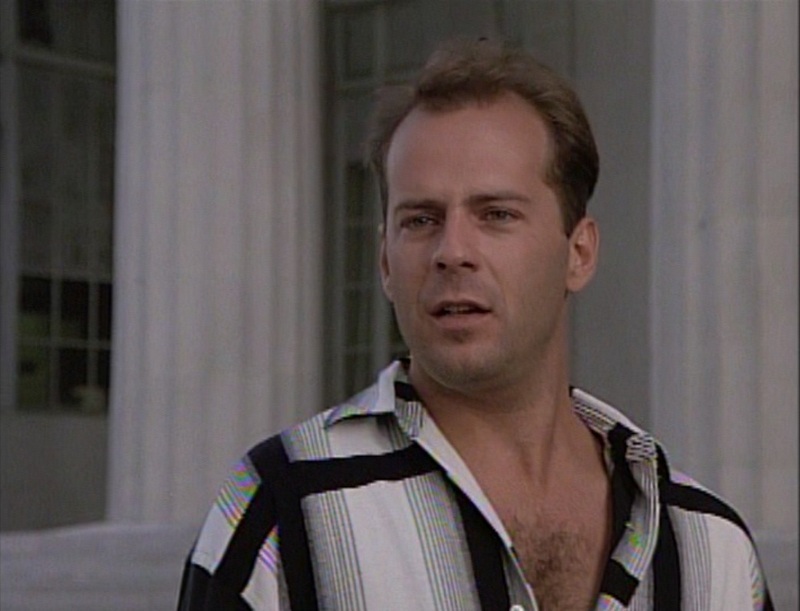 Bruce Willis’s work in “No Exit” is legitimately great. I’m not surprised that this episode led to him headlining his own series with Moonlighting. His Tony Amato is a charming and intelligent and yet terrifying man who has a deranged, complicated relationship with his wife Rita. Tony is an international dealer with a long reach and even though his wife has tried to escape, Tony has done everything he can to keep her around (i.e., he’s threatened her life and constantly beaten her). While Crockett and Tubbs do surveillance* on Tony, they discover his treatment of the wife, which is so bad that Crockett has to pretend to be a hitman that she hires to take Tony out. *On the formula front: I love how almost every episodic plot begins with the team doing surveillance. That’s a different framework than cop characters discovering a body, or driving to the scene of the crime. Crockett and Tubbs kind of fall into these situations. That’s fine, but certainly worth pointing out. As the episode progresses, Tony and Rita’s relationship continues to deteriorate. There’s a scene in the middle of the episode where Tony tries to charm Rita with some jewelry, but as she rebuffs him it turns into a creepy physical confrontation. Teddy Pendergrass’s “Stay With Me” plays as the Amatos struggle in this bright, narrow hallway and Crockett (kind of weirdly) watches it all go down. It’s a staggering, odd, and stirring scene that allows Willis to put on a few different personas in a very short time. While the macro crime story of the episode is a bit silly with Tony trying to move missiles(! ), Willis crackles whenever he is on screen. It’s a star-making performance, if such a thing does exist in a random, early-season guest star turn for a new show (and his case, it apparently does). And again, these two guest stars really help snap the show into a more consistent rhythm after the weird shifts back and forth between extremely dramatic stories related to the pilot and the lower stakes of “Heart of Darkness” and “Cool Runnin’.” Vice is likely to balance those two spaces throughout its first season, but moving away from that messy Calderone story and focusing more on Crockett and Tubbs just barely scraping by as they stop some of the most dangerous SOBs in Miami is in the show’s best interest. Settling into that more consistent rhythm involves one final point of old business: introducing a new lieutenant. Replacing Gregory Sierra’s Rodriguez is Edward James Olmos, and although I didn’t have a problem with Sierra’s performance, Olmos is a dramatic upgrade. Rodriguez felt like a stock authority character only there for Crockett and Tubbs to ignore when necessary—and to be killed when needed, apparently—but Olmos’s Lt. Castillo is much more of a real presence, which is part Olmos and part the writers actually putting in an effort to make Castillo distinctive. The character’s steely persona clashes perfectly with Crockett’s roguish charm and Tubbs’s I’m-probably-on-all-the-drugs-right-now energy. When Crockett and Castillo meet for the first time in “One Eyed Jack,” Crockett tries to introduce himself, only to have Castillo coldly ask him if he filed a report. Crockett says no and the resulting stare of disappointment from Castillo is tremendous. See for yourself, and watch out for my favorite part when Tubbs takes his feet off the desk in fear. Castillo has less of a presence in “No Exit” but he’s certainly a great addition to the cast. In just seven episodes Vice has already established that it loves to create situations where Crockett and Tubbs squabble with authority—in “One Eyed Jack,” Internal Affairs tries to nail Crockett for taking bribes; in “No Exit,” the partners get screwed by the FBI—so bringing in an authority figure who seems both competent and intimidating should pour some cold water on Crockett and Tubbs’s renegade maneuverings. Olmos is great and it’s nice to have another character who actually pops off the screen. GATOR WATCH: Elvis makes his grand reappearance in “One Eyed Jack” when animal control tries to take him off the boat after he apparently ruined a party. Crockett saves the day with some excellent knowledge of county statutes and cracks wise about Elvis eating donuts. GO FAST BOAT WATCH: No boats this week. But missiles! Side note: I’ve procured this book by James Lyons spotlighting Vice with a more academic focus. I’ll be going through it and probably discussing some of its points in future reviews. You’re pumped. This article about Miami Vice is very informative. I think it is much easier for the audience to look past the formulaic nature of the story.